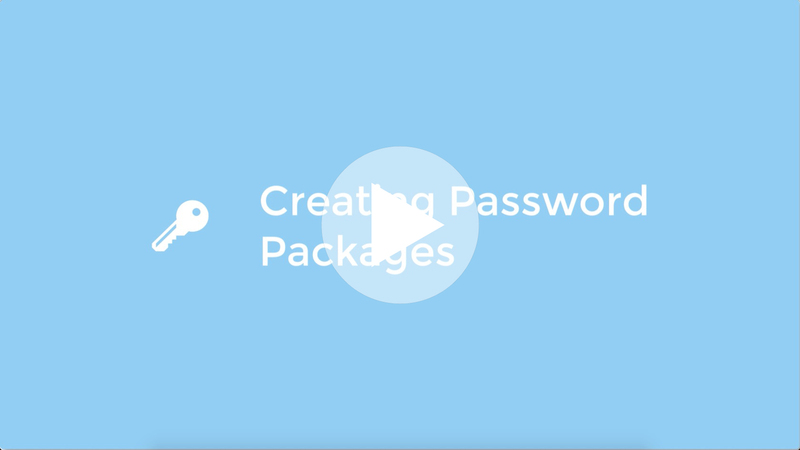 By creating a Password Package, you can add Password Groups that can be added to videos and playlists to lock them down to be only accessible with the passwords associated with the password package applied. If you want to check out some Password Restriction Demos and extra information please visit our Password Protection information page. As addition to the Simple Password that we cover in another guide, you can password protect your video or playlists by linking them to a Password Package. Inside of a Password Package you can add new or existing Password Group(s) (containers). Then inside of the Password Group(s) you can add the actual passwords (and set expiry period, total allowed uses) , which you can provide to your to individual viewers so they can unlock the videos that are linked to the Password Package that contains the Password Group in each the actual password is stored. You have then given those 20 passwords to each employee in those 2 departments. You have linked your whole playlist by going to Playlist Setting > Access Control > Password Protection > “Company on-boarding videos” package in order to password protect all existing and new videos that will be added to this playlist. Now only those 20 people can unlock the whole playlist and watch any video inside of it. Note that those 20 people cannot watch other playlists that are linked to different Password Package that does not contain the 2 password groups in which the given passwords are located. When new employee starts or leaves, you can simply add new password or remove existing from the password group and this grant or deny the access immediately. To create new Password Packages you will need to go to ⚙️ Settings > Access Control 🔽 > Password Protection. Here you will see a list of your current Password Packages as well as the default Access Without Password package. To create our new Password Package you will need to click on the ➕New Package button. Show Password Wall To Viewer: Choose when your viewer sees the Password Wall. Immediately: The immediately option will bring up the password request as soon as the viewers press the play on the Player. With Delay: Here you can enter a set amount of seconds of Free Viewing Time before the Password Wall will be displayed to the viewer after they press the play button. To save your Password Package simply click on the green ✅ Save button below. With your Password Package created you are now able to add Password Groups to it.